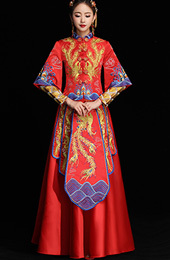 A full length embroidered skirt with embroidered flaps. This qun gua is really beautiful.Excellent quality and material. Everyone like this suit. Thank you for helping to check my size. This qun kwa is for my Chinese tea party. It is so beautiful, the quality is great and I am in love with it. The customer service helped me to choose the size. They are very patient and professional. Thank you very much! This qun kwa was stunning! I absolutely loved it and looked perfect. Of course I took exact body measurements and let cozyladywear customer service help to check if I chose the right size, and it was excellent! This is the third order I buy from this site and I am very satisfied!